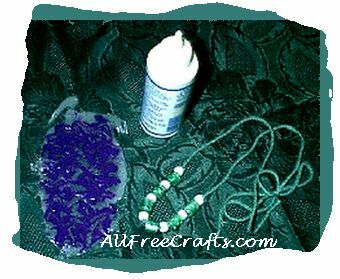 Did you know that you can make pretty beads for bracelets or necklaces using glue mixed with paint? Acrylic paint or fabric paint for texture. 1. Squeeze some glue onto a piece of plastic wrap and spread the glue out, taking care not to make it too thin. 2. Squirt out a line of paint from the beginning of the glue to the end of the glue in whatever colors you choose. Take a toothpick or popsicle stick and squiggle it through the paint line so that it blends in (like drizzled white chocolate on dark chocolate cake frosting). Let dry overnight. 3. In the morning, peel the layer of glue off the plastic wrap and turn it to let it dry for an hour or so on the other side. 4. Take a pair of not-so-good scissors and cut the glue layer into lengthwise strips, about a half inch wide. 5. Wrap the dowel or pencil tightly with plastic wrap and secure it with tape. Now take one end of a glue strip and begin rolling it around the pencil into a bead. Secure the end with a tiny amount of glue. Let dry and pull off the pencil. Now make more beads in different colors. Thread them onto string or elastic cord to make bracelets or a necklace.